Marian doctrines featured prominently in 19th-century theology, especially the issue of the Immaculate Conception of Mary. During his pontificate, petitions increased requesting the dogmatization of the Immaculate Conception. In 1848 Pius appointed a theological commission to analyse the possibility for a Marian dogma. [full citation needed] On 8 December 1854 he promulgated the apostolic constitution Ineffabilis Deus is an Apostolic constitution defining the dogma of the Immaculate Conception of the Blessed Virgin Mary. To commemorate his term as pope, a street in Montreal is called Pie-IX (Pie-Neuf). There is also a stop on the Montreal Metro system called Pie-IX serving Olympic Stadium. In addition, streets in Santiago, Chile, and Macon, Georgia, are called Pío Nono, Italian for Pius IX and a secondary school with the same name (Pio IX) in Buenos Aires, Argentina. Various sweets in Spain, Latin America, and the Philippines are also named piononos. ^ see Martina III, and "Papst Pius IX". damian-hungs.de (in German). Archived from the original on 11 March 2007. Retrieved 11 March 2007. ^ Ocampo, Ambeth R. (9 January 2015). "From Pius IX to 'Pio Nono'". Philippine Daily Inquirer. 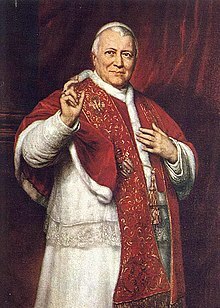 Retrieved 22 April 2019.
an account of Pius IX's daily life. Wikimedia Commons has media related to Pius IX.